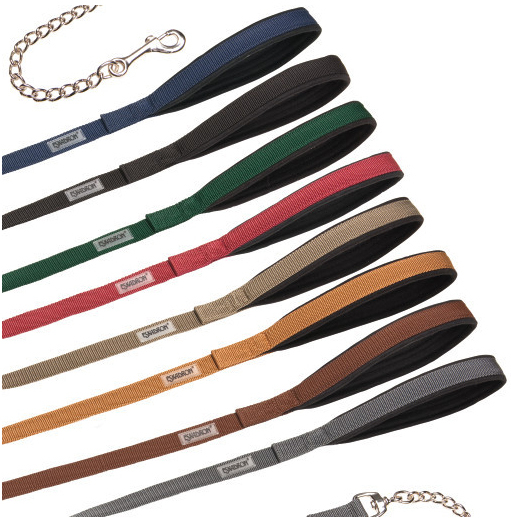 Easily adjustable by means of non-slip push buckle on poll strap. Made of double-processed, tear-proof 25mm webbing. With soft padding in the nose and poll area. Classic Sport band on the noseband gives the headcollar a special look. 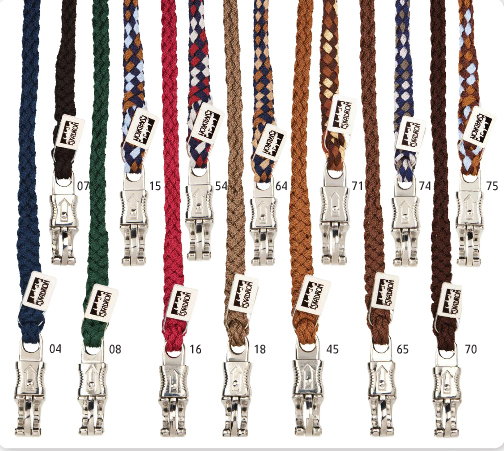 Available in Navy (04), Navy-White-Red (14), Bordeaux (16), Mud (18), Cognac (45), Mocca-Ice (65), Chocolate (70), Anthracite (77). Easily adjustable by means of non-slip push buckle on poll strap. Made of double-processed, tear-proof 25mm webbing. With soft padding in the nose and poll area. 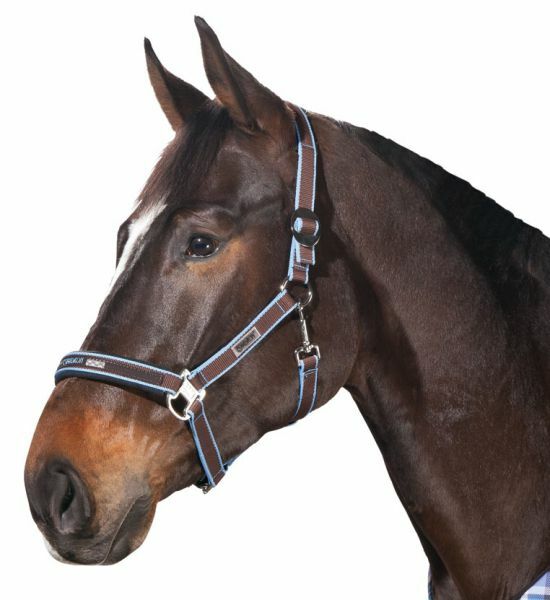 Trend band application on the noseband and the brass plated fittings gives the head collar a special look. Available in Navy (04), Black (07), Tanne (08), Bordeaux (16). Easily adjustable by means of non-slip push buckle on poll strap. Made of double-processed, tear-proof 25mm webbing. With soft Sheepskin padding in the nose and poll area. 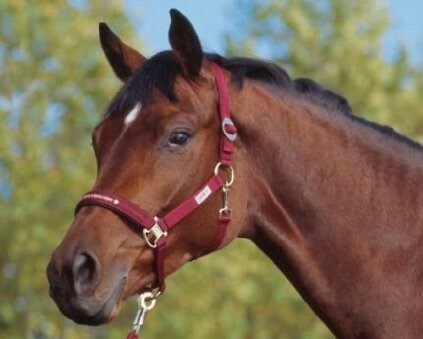 Classic Sport band on the noseband gives the head collar a special look. Available in Navy (04), Cognac (45), Mocca-Ice Blue (65), Chocolate (70), Anthracite (77). With the Head Collar Control you improve the influence on your horse and increase your own safety. 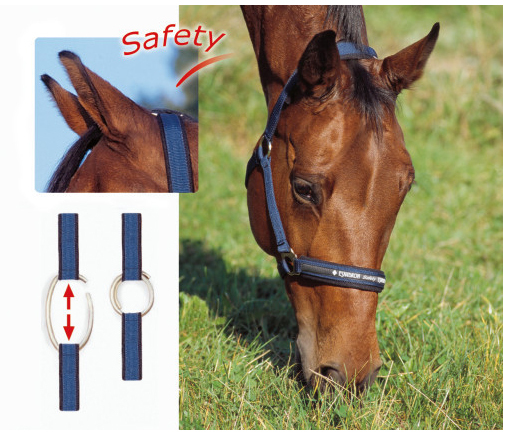 In the case of the Head Collar Control it is possible to make use of this function in three different stages. Normal Use: The Rope is attached to the ring on the Head Collar. Use with Strong Influence: The Lead rope is attached to the chain ring in such a way that pulling force is exerted on the chain. It is essential for it to be fitted correctly to your horses head. In the animals interest the user must ensure that he observes reasonable bounds in the applications. Available in Navy (04), Black (07). Greater Safety for your horse if an emergency should occur. As a result of the integrated ring in the head piece of the Halter, the horse cannot get caught up or strangle itself if an emergency occurs when no-one is there to react. 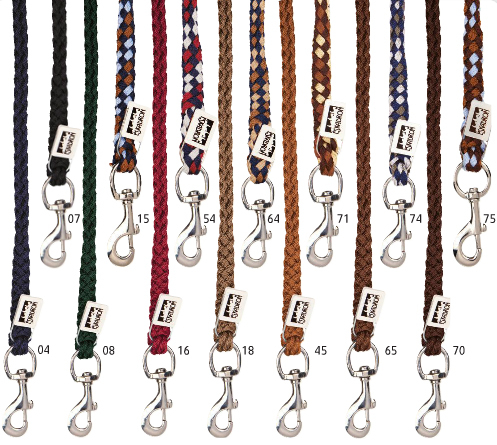 This Head Collar is particularly suitable for when the horse is out at grass or in the walker. In response to a certain pressure the ring on the head piece comes apart and the Head Collar opens. 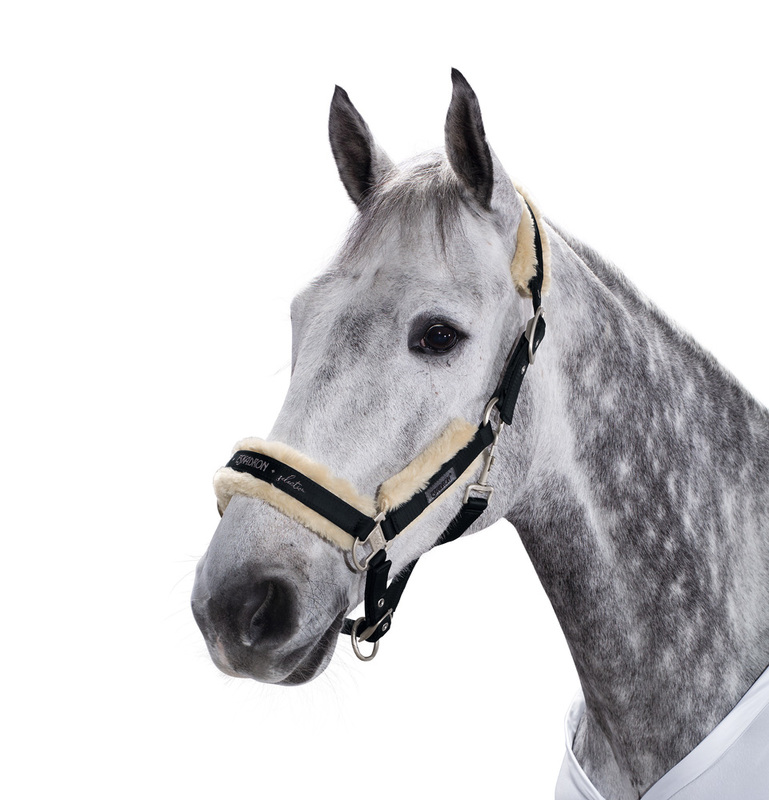 The ESKADRON Safety Halter is not suitable for tethering a horse. Various adjustments possible in the nose and poll area by means of pin buckles. Made of double-processed, tear-proof 25mm webbing. With soft padding in the nose and poll area. 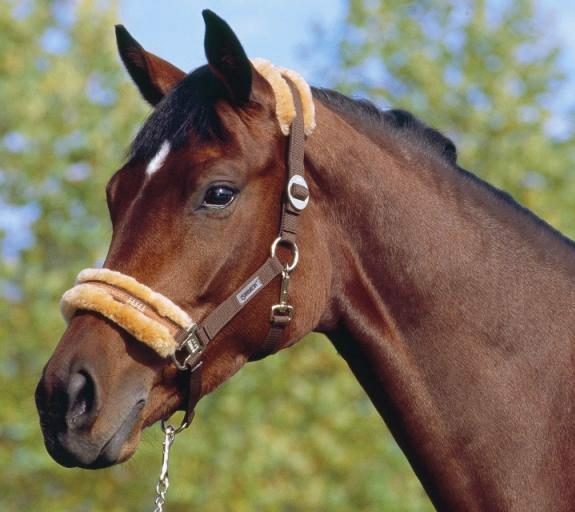 Classic Sport Band on the noseband gives the Head Collar a special look. Available in Navy (04), Black (07), Mud (18), Cognac (45), Red-White-Navy (54), Navy-Lightn-Nougat (64), Chocolate (70), Chocolate-Cream-Nougat (71), Anthracite-White-Navy (74). Various adjustments possible in the nose and poll area by means of pin buckles. Made of double-processed, tear-proof 25mm webbing. With soft Sheepskin padding in the nose and poll area. 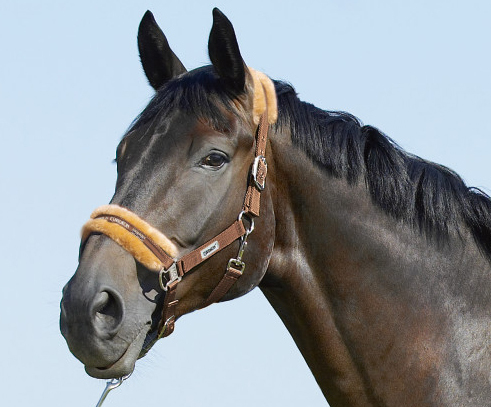 Classic Sport Band on the noseband gives the Head Collar a special look. Available in Navy (04), Black (07), Cognac (45), Navy-Lightn-Nougat (64), Chocolate (70), Chocolate-Cream-Nougat (71). Easily adjustable by means of non-slip push buckle on poll strap. Made of double processed, tear proof 25mm webbing. With soft padding in the nose and poll area. 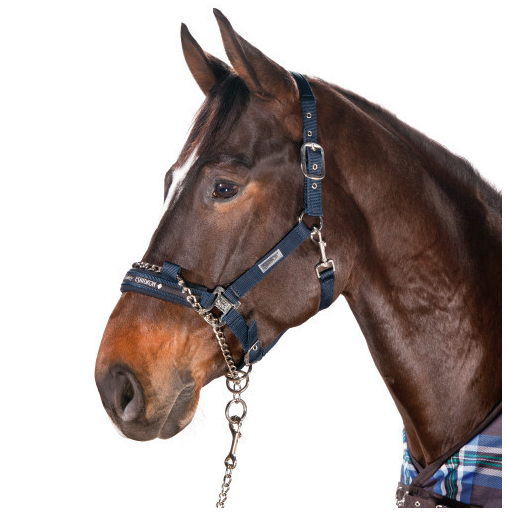 Trend band application on the noseband and the brass plated fittings gives the head collar a special look. 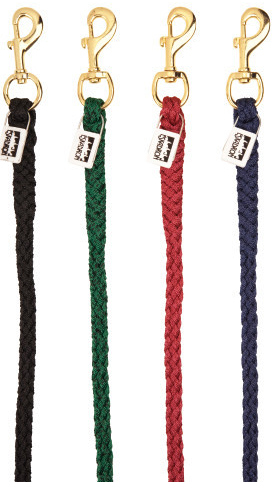 Made of plaited, tear-proof polypropylene yarn with inserted endpiece, 2m long, with Brass coated panic hook. As a special accessory, individually marked with a name plate. Available in colours listed in image. Made of plaited, tear-proof polypropylene yarn with inserted endpiece, 2m long, with nickel coated Swivel hook. As a special accessory, individually marked with a name plate. Made of plaited, tear-proof polypropylene yarn with inserted endpiece, 2m long, with Brass coated Swivel hook. As a special accessory, individually marked with a name plate. 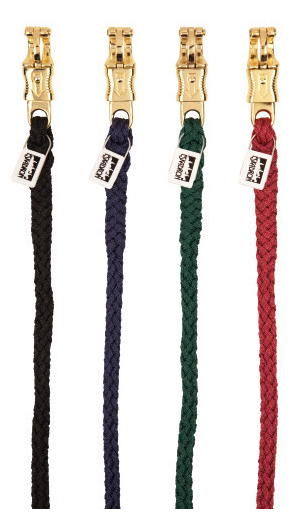 Made of tear-proof polypropylene yarn, 2 m long, with a 70cm Nickel OR Brass Coated Chain and Swivel Hook. Made of plaited, tear-proof polypropylene yarn with inserted endpiece, 2m long, with nickel coated panic hook. As a special accessory, individually marked with a name plate.